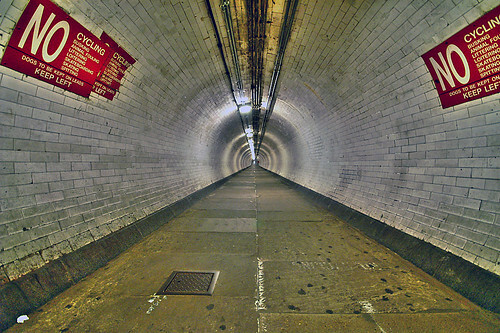 The Greenwich Foot Tunnel will probably be closing at 9pm for repairs on the evening of the race. The alternative route back to Greenwich from the event is via the DLR, however this does not accept bikes. Cyclists needing to return to Greenwich after the event are advised to run early and leave before 9pm to avoid a potentially lengthly detour. As an alternative, Thames Clippers, which allow cycles on board, will be running a specially subsidised evening service between Masthouse Terrace Pier and Greenwich Pier. Before 9pm, it is possible that, if the lifts are operating, the stairs may be closed (or vice versa). Pictures by Nick Garrod and Akanekal, licensed under Creative Commons. Roads and pavements in Kingston are currently very icy. It may be necessary to postpone the Street-O event, due to take place on the evening of Tuesday 12th, if the unsafe conditions persist. A decision on whether to postpone the event will be made late on Sunday evening. The decision will be posted to the SLOW website and also by email to people on the SLOWmail mailing list late on Sunday evening.